MIAMI - Paul Pierce was clearly tired after a 43-minute performance in the Celtics’ 112-106 overtime win over Miami last night. But Pierce was inspired by the play of Rajon Rondo, who scored 8 points after the Celtics fell behind with 0.6 seconds remaining in regulation time. Pierce did not take a shot in his first 12 minutes since returning to action after undergoing surgery for a knee infection. Then he converted his first field goal attempt since Dec. 22, a transition 3-pointer to cut the Celtics’ deficit to 44-43 with 5:23 remaining in the half. Pierce on the Celtics’ ability to rally from an 11-point fourth quarter deficit: “It’s our resiliency. We don’t look at the score, we know what type of team we are - we don’t say, ‘This game is over, we’re down 11.’ We’re like, ‘Hey, we just got to put together a couple defensive stops. We’re a defensive team first, it’s time to buckle down,’ and that’s what we talked about in the timeout. 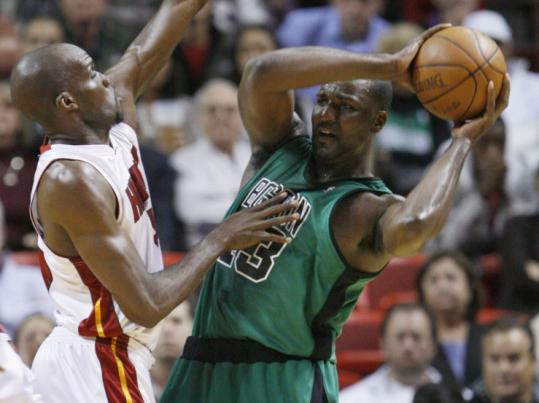 The Celtics nearly lost the game with 5.5 seconds on the clock and the score tied, 99-99, Dwyane Wade stealing the ball from Ray Allen after Allen corraled a Kendrick Perkins inbounds pass. Wade roared down the court and dunked. “I was mad, I should have just called a timeout and let Doc [Rivers] draw up another play,’’ Perkins said. Said Allen: “That’s the emotions of the game, they go up, they go down. You make a big play and the next possession you could do something to lose the game. I did feel like I got hit a little bit [by Wade] but the referees were going back and forth. I did feel bad for the team if that’s the way the game ended, but Doc drew up a great play and Rondo being the athlete he is, just finished it for us. Rasheed Wallace committed his sixth foul with 1:10 remaining in regulation time. Wallace had 16 points and nine rebounds in his third Celtic start. Perkins practiced yesterday morning for the first time since suffering a stomach illness likely related to a snack consumed while viewing the film “The Blind Side’’. “I think it was food poisoning,’’ Perkins said. “I ate some chicken tenders at the movie, that’s what I think it was. I’m just happy to be back.’’ . . . Eddie House (flu-like symptoms) did not travel with the team but could return for the visit to Atlanta. Kevin Garnett (knee) is on the trip, which concludes in Toronto Sunday, but is not expected to play . . . The Celtics waived Lester Hudson after the shootaround. If he clears, the team could sign him to a 10-day contract. With Marquis Daniels (wrist) out, none of the backup point guards with the team in the exhibition season are available.